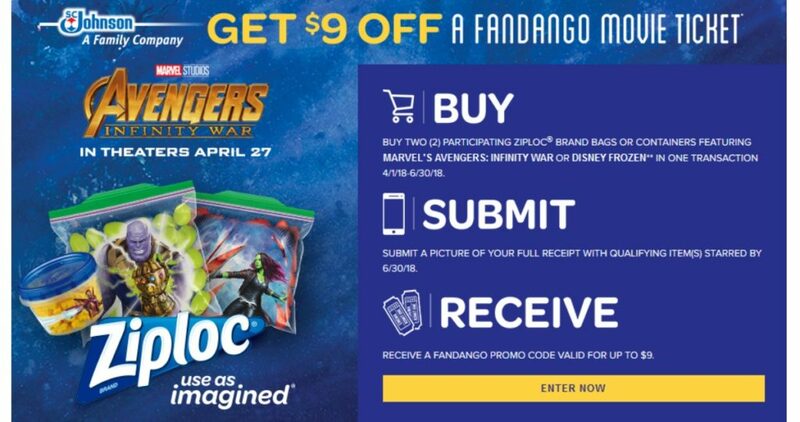 There is a new rebate offer available to get up to $9 off a Fandango movie ticket when you buy two Ziploc products through 6/30. Save even more with two Ziploc coupons out right now too! To get your rebate, purchase two Marvel or Frozen Ziploc bags or containers in one transaction at participating stores. You will need to mark your qualifying purchases on your receipt and take a picture. You will then need to submit your image and fill out a form with your contact information. Once your submission is validated, you will receive an email with a $9 Fandango coupon code.